Sounds like these are quite the force to come up against for someone foolish enough to attack your Castle. If you’re a defensive player with a lot of cavalry, a few of these in your army will leave you more than capable of fending off an enemy attack. Thankfully, getting a few War Elephants to help your defensive cavalry is isn’t difficult. 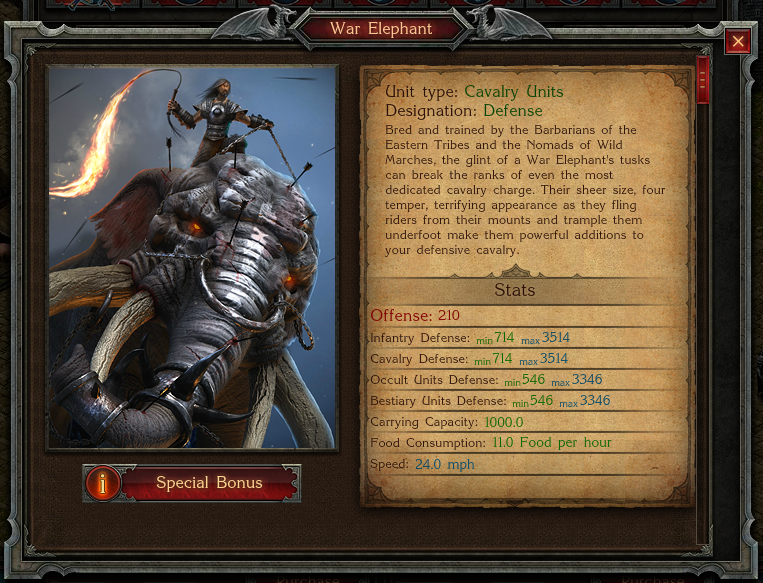 A War Elephant is what’s known as a Legendary Unit. If you’re not sure what a Legendary Unit actually is, then here’s what Plarium says about them: “Each additional Offensive Legendary Unit that is joined by supporting units receives a bonus to their Offensive capability”. For us this means that Legendary Units get more powerful when sent out with Units to support them. The more Units you send out to support them, the bigger the bonus they’ll receive (up to a point). 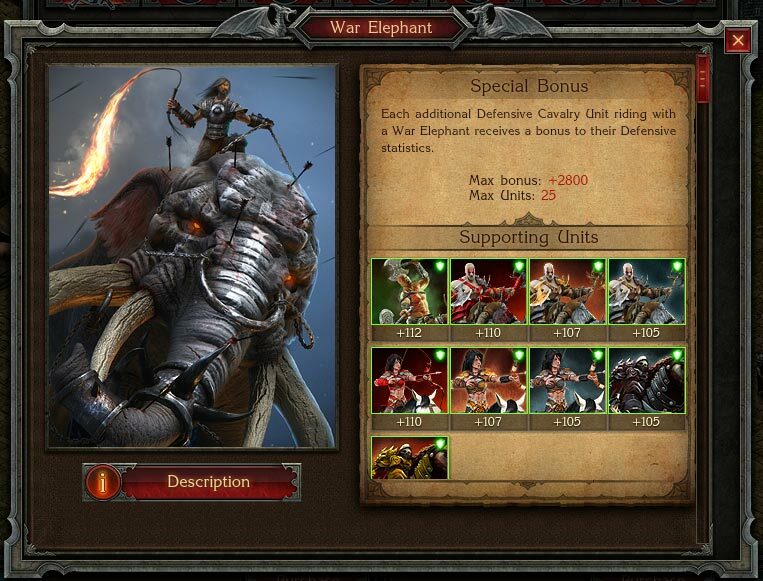 The screenshot above shows the bonuses each supporting Unit grants to War Elephants when sent out alongside them. For example, if you send out 10 Reiters alongside a War Elephant, it will receive +1050 bonus to its stats, making it a mean opponent for any army to come up against. The more supporting Units you send out alongside it, the higher the bonus will be – up to the maximum bonus of +2800, as shown here. Any time you want! There are no special requirements to have a War Elephant in your army, so just pop over to the Black Market and purchase one! War Elephants can be bought directly from the Black Market. Spend some coin and buy them from the Black Market – think of it as an investment! There are a lot of things you can spend money on in Stormfall, but you really can’t go wrong with spending some of it on Legendary Units, and specifically a few War Elephants. All the benefits of having a few War Elephants massively outweigh the cost, making it a simple decision for the wiser Lords and Ladies!